LG: What sort of childhood did you have? Were you the sort of child who lived a lot in your imagination? SS: Growing up I had a whole slew of cousins and my childhood was filled with adventures and misadventures with them. Between us we had an extraordinary amount of imagination. We would stage plays and other “experimental” productions which could be quite … interesting! We always practiced having a wonderful sens of humor in my family. There was this way that our collective energy and applied imagination was able to disrupt the landscape into its more surreal versions. Surrealist writers have been important to me and reading them has taught me a great deal about the generative aspects of transgression, and how the dream – as a form of literature – makes it possible to break out of binary ghettos we may have set up for ourselves. When I think of my continued fascination with these things I think my childhood spent with cousins, how we were experimenting with other ways of knowing and engaging through our imaginations. Those times were great fun, never lacking in drama, and taught me a lot about the power of story. LG: Were you a big reader as a child? What were your favorite books? SS: Reading was celebrated by the adults in my life when I was a child. Reading was never a stodgy thing to do. For example, it was sneakiness of the highest order for my sister and I to turn on flashlights after the adults went to bed and read Nancy Drew under the covers when we should have been sleeping. My grandfather had a large library and taught us about the importance of reading and writing. His library was full of history, philosophy, psychology, religion and the classics, and we mainly read from this library, which meant as a child I read a great deal of Plato, Shakespeare and French writers such as Hugo, all of whom were great favorites. I don’t know that I always understood what I was reading then, but it was when I began to love how language could flow and how it felt in the body. LG: Have you always wanted to be a writer, or did you have a moment of epiphany when you chose that vocation? Or did it choose you? SS: I had early experiences that I look back on now as having divinatory significance about being a writer. What those experiences had in common is that they involved the act of seeing and the power of story to make available the logic of mystery – of uncertainty – as a way that made things bearable and known to the heart’s experience. As a child I once saw a relative’s dead body and I remember thinking, “Well, after seeing that I can see anything.” I had this overwhelming sense that this meant something important and that it was a kind of ethical responsibility to be willing to see what was there to be seen. What I did with that seeing was to write. I wrote my first story when I was around seven, and don’t remember a time after when I didn’t want to write (though sometimes I also wanted to be a ball-gown designer in New York City or a nun). I don’t think anyone in my family is surprised that I’m a writer now. Did I choose it? Did it choose me? I have no idea. When I think back to early childhood experiences of writing I only remember that it always felt right, compulsory, very, very close. 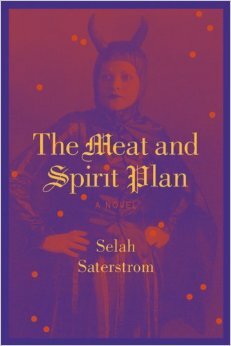 LG: The narrator of The Meat and Spirit Plan is a very complex, incredibly intelligent young woman who’s also very mixed up. What inspired you to write about her? SS: When I was working with “troubled” teenaged girls, I saw the uniqueness of their lives and their fierce intelligence, but I also saw correspondences in their experiences of the body. Futhermore, I saw correspondences between their stories and many of my friends’ stories. I was also affected by other stories, such as the story of the sexual abuse and death of Hunter College student Ramona Moore. As part of my research for this book I also interviewed women who had been sexually abused, and I realized that sexual abuse – something we tend to think of as the exception to the rule – really isn’t the exception. I also work for SASA, a sexual assault advocacy, support, and response team, and the statistics that state one out of three women will be in some way sexually violated is alarmingly accurate and thriving. Through this narrator – who has a variety of sexual experiences, some of which are violations and some which are not – I wanted to examine the cultural conditions around young people and the ways they come into their bodies. I was interested in how sometimes the moment of sexual awareness coincides with moments of sexual disempowerment or disembodiment. Of course there are a lot of reasons why this happens, but what interested me was the break-down in communication we have about bodies in our culture and how this plays out among teenagers and what happens when those teenagers grow up – how we all learn to celebrate our bodies, with their history and complexities, as adults. LG: Mississippi has been the native state of some of the greatest American authors, including William Faulkner and Eudora Welty. What is it about the South, and Mississippi in particular, that makes for such a wealth of literary genius? SS: If only I could offer some insights to this question! I do believe that each region retains its own magical synergy and that this synergy is created by many details – from the kind of flora that grows in the region, the weather, the history of the region itself – the history that is retold and celebrated as well as the history that is not told, is not celebrated. The way these details come together in Mississippi creates quite a synergy. One need only listen to the Blues coming out of the North Mississippi Hill country and the Delta to sense this. And I’d add, gospel music (such as The Mississippi Mass Choir). Mississippi is a place I love very much. It has certainly been a generous landscape in which to ruminate upon the complexities of the human condition as well as the human heart. Thank you so much to Selah Saterstrom. It was a pleasure.